BY WEST PAPUA MEDIA WITH LOCAL SOURCES. Australian supported Detachment 88 unit allegedly involved in rampage. A bloody and brutal rampage by Indonesian security forces is currently underway in Wamena, in the Baliem Valley of West Papua, after two soldiers were killed for running down a small boy in Wamena on Wednesday afternoon. At time of writing, up to 500 houses have allegedly been set alight by soldiers from Battalion 756 Mim Anesili Wamena, and kiosks and shops have been hit with flamethrowers in the suburbs of Honailama and Sinakma. Live ammunition is being fired indiscriminately according to local human rights sources, who claim that “scores” of people have been brutally beaten and shot by rampaging soldiers. Exact casualty figures have not been able to be confirmed, however unconfirmed claims are circulating that 13 people have been shot dead so far. The situation unfolded on Wednesday afternoon in the outlying village of Honailama when two members of Kostrad (Strategic Reserve) battalion 756, identified as Pratu Ahmad Saifudin and Pratu Ahmad Saelan, were driving a car at speed through Honailama, and hit a young boy (as yet unidentified) who was playing at the roadside. The soldiers were alleged to have been careless, and enraged villagers – including clan members of the boy – dragged the soldiers from the car and beat them to death. Upon hearing of the beatings, the entire army battalion (1500 combat troops) was mobilised onto the streets of Wamena, and according to witnesses, have opened fire indiscriminately at any Papuan person. The battalion is also being supported in a search and cordon operation by the entire Wamena Brimob police commando battalion, and also officers from the Australian-trained and funded Detachment 88 counter-terrorist group. All elements of the Indonesian security forces present in Wamena are participating in the rampage operation, amid unconfirmed reports of hundreds of arrests. Local sources are reporting that the carnage is so intense that smoke is filling the entire Baliem Valley and covering the town. 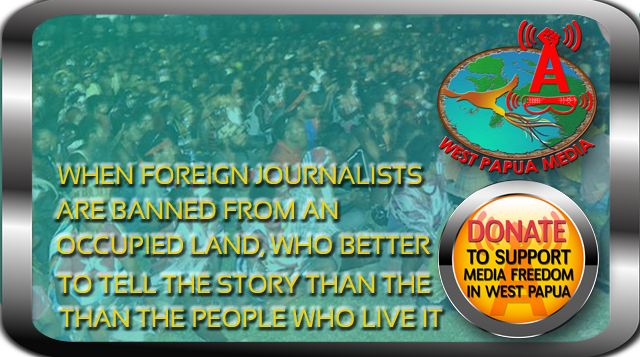 A witness has spoken to the West Papua Media team and confirmed the situation in Wamena. “It happened in front of my house in the compound I live. Soldiers have shot and hit people. The army beat innocent people who know nothing and did not understand why. This is really a violation of human rights. My house was stoned and the glass window was shattered into pieces,” the witness, who asked not to be named, told West Papua Media via SMS. Human Rights sources in Wamena are saying that local people are terrified that the Indonesian army actions look like they will eclipse the “Bloody Wamena” incident of 6 October 2000. That incident saw hundreds of people wounded and at least 38 people shot dead or dying from injuries inflicted by Indonesian torture in the aftermath of a flag-raising incident. Sambon also said that TNI and POLRI forces are also burning local houses both in and outside the town of Wamena. This is a developing situation – please stay tuned to West Papua Media newswire. Media note: Photos and video of this ongoing situation are currently being sourced, and West Papua Media will upload links for general distribution, on condition of credit to West Papua Media, when it becomes available. Donations to cover costs would be appreciated if broadcast. Why doesn’t the dam Australian media publish this. It is to busy worrying about Schapelle Corby and Craig Thompson, while a genocide is happening on our own door-step. I feel sorry for the West Papuan People. Indonesia should stop doing this. That is their land and they want to be free. Why killing on their on land. The Lord our creator says that whether we are black, or white or any color, we are still the image of God. So why are this people keep killing the Papuans. You cannot bring this land along with you when you die. You die by yourself and no bringing anything with you, and why you want to kill this people for land? So please lets put our hands together, and do something to help our friends from West Papua. It is heavy handed tactics applied in revenge for a 3 lives lost (the boy and two soldiers) in sircumstances purely criminal in nature. The act amount to genocidal exercises. One of the strategies applies by the Indonesian authority (armed forces and the national government)in order to suppress and kill the people of Papua both direct and in slow motion. I think it is a time when Those people in international communities and governments should speaks against the Indonesian even louder. It is happenning in many areas (Paniai, Yapen, Jayapura) and now in Wamena. Is Indonesian deserve impunity over their gross human rights abuses in Papua? This conduct is bloody atrocious. How is it that this is not being reported in the mainstream Australian Press, especially considering that Australian Tax dollars are being spent to train troops to act in this manner. If Australian Soldiers are involved, they need to be recalled and answer for their actions! There is no reason or excuse for action against unarmed civilians, whether they are percieved to be rioting or protesting the unlawful death of a child. It’s time Australia started to defend the human rights of the very people that were so loyal and true to our Soldiers in ww2, and stop kowtowing to the Indonesians and their abuses against people that have no way to defend themselves. Very sorry and outraged about what is happening here. I will try and share all I can via the Free West Papua Facebook page and am trying to upload the images to BBC news. Thanks for the information. Keep up the work. the only way that the TNI will stop killing innocence is if Australian independent and mainstream media make it the main story with full-gore images like those that came out of East Timor in 1999…and then there has to be the scale of outcry that we saw in civil society when the public stopped Garuda Indo planes from flying at sydney airport…then there needs to be a plan in place to combat the Indo media and the “disintegrasi” mantra they keep pushing all the time. Both sides are wrong. The viillagers avenged the boy’s death, which was an Accident, by killing the soldiers. 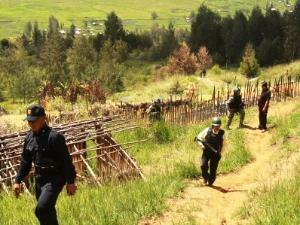 The army and police avenged their fallen, which was killed Intentionally, by attacking the villagers. It’s a same thing, only in a different scale. Anyway i think this not a genocide. It is a retaliation killing. They didn’t kill the villagers because they are papuan, but because they, at least some of them, killed their friend. The villagers would’ve killed a random soldier if they failed to kill the perpetrators. Why? Retaliation, anger. The army did the exact same thing. No Kevin, that is rubbish, the Army did not kill the boy by accident. They were driving at high speed right through the village, in a show of absolute disregard for the lives of the people whose land they are occupying. That is not an accident. The boys death is a natural consequence of a deliberate action by soldiers with no respect for the lives and safety of the people they oppress. The soldiers should have been arrested and put on trial for manslaughter, immmediately, because that is what is was – a culpable killing. The villagers knew that was never going to happen, and in their traditional law, and unlawful killing is subject to payback. Whether you believe for or against an eye for an eye, that is the LAW system that has been in place for over 50,000 years in Wamena. ONLY the perpetrators of the killing of the boy were targeted, according to Law. The Indonesian rampage was exactly that. The soldiers acted illegally and brutally, attacked INNOCENT people and destroyed property that had no relation to the original incident. THAT my friend is a war crime. This is the foreign media propaganda to overthrow the government of Indonesia and Indonesian troops. and the news is not balanced with the reality. example … why almost no news is preaching attacks on officials, the savage attacks by the separatists, and the deaths of civilians caused by the action. no real story Indonesian soldiers massacred, killed the people of Papua. if there is … Human Rights Commission of Indonesia and the people will act. do not need foreigners to participate. This is untrue reports that were disseminated. I live in Papua and the people here live in harmony between Javanese and indigenous tribes of Papua. you have to realize is that much has been done by the government to promote Papua Indonesia. and separatist gangs few. they incite the people … kill the soldiers and the people close to the army because the army is very good with us. please find accurate news from the people themselves … not a separatist. we want to live in peace with everyone. we know the target of a foreign country papua because natural resources and beautiful scenery. one small problem in your commentary Guwe – this report was assembled from witness journalists who live in the area, edited by Papuans who live inside and outside Papua, and verified also by indigenous Papuan journalists. Outsiders did not write this. The days of you claiming this is a fabrication are over my friend, with the ability to instantly transmit video and photographic proof of Indonesian military and colonial atrocities, in addition to real time witness reportage. You are welcome to live in your fantasy of a benevolent colonial occupation, and you are welcome to take Indonesian money to sell out your people by spreading false reports of peace..
Why no news of the savage attacks by “separatists” on government officials? Because they are done by OTK – orang terlatih khusus – or Kopassus soldiers pretending they are Papuans. But you already know that, because you are Orang Terlatih Khusus.